We start by drawing egyptian style line outlining the eye with Black SC-00 and ending with a corner at the end of the eye. 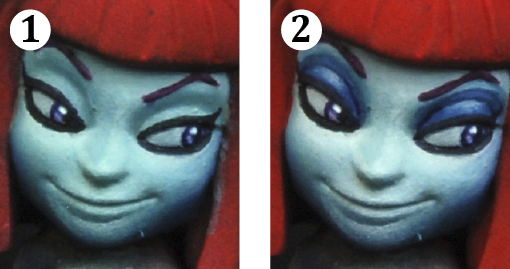 To make the eyeshadow we’ll need a mix of Bering Blue SC-06 and Deep Blue SC-55 on the eyelid and the eye socket, the last highlight will be applied on the center of the eyelid with Bering Blue SC-06. First we paint the entire eye and the cavity with Deep Blue SC-55 and then proceed to paint the eye and the edges of its socket with Adriatic Blue SC-15. Second, intensify the light coming out of the eye mixing Adriatic Blue SC-15 with White SC-01 and applying it to the eyeball and on the edges of the basin with a very thin outlining. Finally and once determined the direction that it will look at, draw an iris with White SC-01 leaving the blue below as a pupil, also intensify a little more the light that comes out of the eye outlining with White SC-01 the upper and lower areas of the eye socket were the eye is looking at. To make the spots we use Bering Blue SC-06, we use the same color that we used for the skin, apply it in the form of polygonal spots. Finally we’ll highlight these spots with Moonray Flesh SFG-17 added to the Bering blue SC-06 toward the center of the leg to respect its natural volume. The base color for the buckles is made with Brown Leather SC-31, as they will be an orange metal kind. The first highlight will be made with Kalahari Orange SC-14, applied on areas that reflect light more slightly. The Reflexes will be made with Lilith Yellow SFG-09, in the form of tiny dots or going over the stripes with more marked volumes. For the skirt we’ll use Deep Blue SC-55 as base color, coating the entire skirt completely. For the gloves the base color will be a mix of Inktense Violet SC-82 and Eclipse Grey SC-16. We’ll start to mark the skirt volumes mixing Inktense Violet SC-82 with Deep Blue SC-55 and White SC-01 added to the mix to lower down the saturation. On the gloves we will be adding more White SC-01 to the mixture and sometimes we’ll also add Inktense Violet SC-82 to the mixture to maintain the color as we lighten it up. The last two highlights for these areas will be made by adding more and more White SC-01 to the mixtures until achieving the desired lighting.